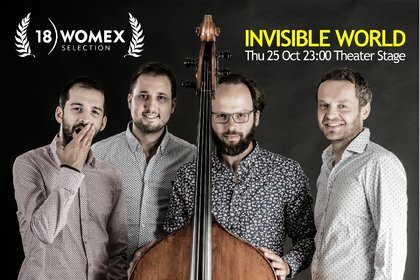 “Invisible World“ is a truly unique venture within the landscape of contemporary Czech music. 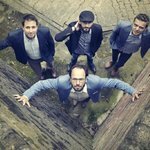 The project´s own musical compositions combine elements of jazz, chamber music and world music from the Mediterranean and South-Eastern regions of the European continent. Their approach is not based on individual exhibitions, but rather on a philosophy where music is a clear and crystalline medium which irradiates a rich palette of emotional hues. These are inspired by strong melodies which are adorned by a subtle and seemingly effortless lacework of improvisation. 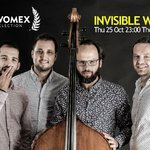 Invisible World performed on world & jazz festivals and venues across Europe, Africa, United Kingdom and Japan. In 2017 was awarded the Audience Award on the international music conference Czech Music Crossroads in Ostrava and recieved the invitation on Ritmo Festival in Budapest. In 2018 got nomination on Czech “Grammy” award Ceny Andel in category Jazz & Blues. 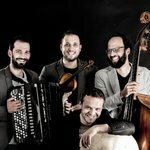 Efe Turumtay (violin) was born in Istanbul, Nikola Zarić (accordion) in Serbia and Kamil Slezák (drums) in Moravia. Tomáš Liška (upright bass) met all three in the course of his musical journeys around the world, while tirelessly searching for fascinating interactions between instruments and cultures which would enthrall both him and his audiences.